The annual ITS World Congress is the central meeting point of professionals of the ITS sector. The ITS World Congress rotates between Europe, the Asia Pacific region and the Americas. The Congress provides the ideal opportunity for all stakeholders to come together, discuss and make the necessary contacts to move initiatives forward and to develop their business by exhibiting and demonstrating state of the art ITS solutions. The Congresses also showcase the latest ITS achievements from the city and region hosting the Congress, and can help increase awareness of ITS in the Host region itself. 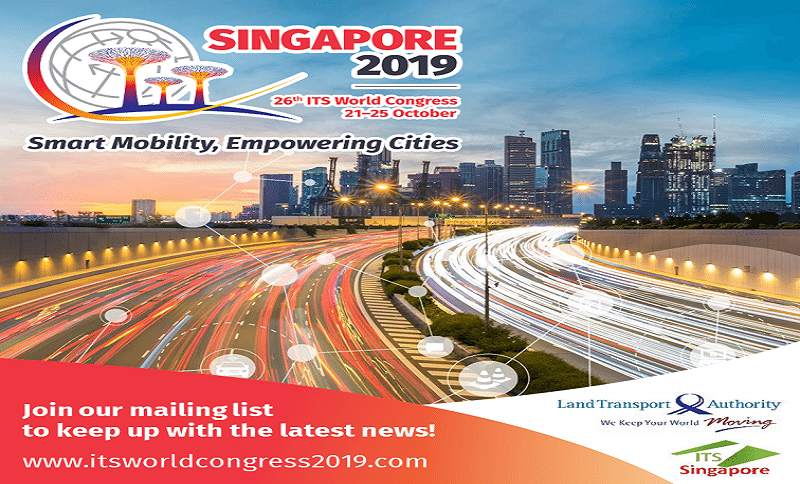 The 26th edition of the ITS World Congress will take place in Singapore on 21 – 25 October 2019. The 2019 Congress theme of “Smart Mobility, Empowering Cities” reflects Singapore’s commitment to create the most liveable smart city in support of a higher quality of life and an ever-connected community. With a comprehensive format of plenary and interactive sessions, as well as a dynamic exhibition with technical demonstrations and tours, the World Congress 2019 will be an opportunity for stakeholders to network, discuss and share ground-breaking transport technology. The variety of central topics of the Congress and further information about the event can be found here.